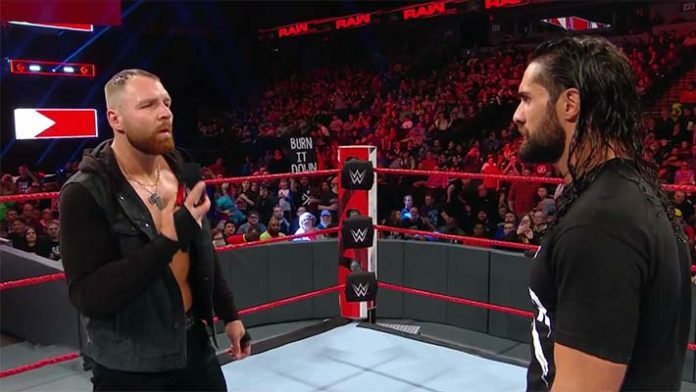 On Monday’s edition of WWE RAW, Dean Ambrose offered some encouragement to Seth Rollins headed into WrestleMania. During the start of the third hour, Seth Rollins was in the ring to hype his upcoming match against Universal Champion Brock Lesnar. He was interrupted by Paul Heyman, who warned the Royal Rumble winner about what’s in store for him in the months ahead. Apparently the Raw script called for Dean Ambrose to set up his “Slay the Beast” line by making amends and talking about their history of starting out together and their time in The Shield with Roman Reigns. For whatever reason, Ambrose kept it short and omitted the storyline explanation of why he is now supporting Rollins. Later in the show, Ambrose went on to defeat Raw newcomer EC3. WWE recently announced that Dean Ambrose has opted out of signing a new contract. He is expected to leave when his current deal expires in April.